The Freechec Tool was the product of two inventive minds, Ed Wosika and Paco Kelly. Back in the dark ages of the 1970's these two conspired and labored over many a now-forgotten loading tool. A lot of their ideas were 'out of the box'. Many of the Tools they designed did those little handy things that you often need when reloading, such as the Nexpander, a multi-stage hand-held neck expander for opening up those odd cartridges that just did not get expanded quite enough to start a bullet. You know, the ones you run into right in the middle of loading a string of 850 rounds? And here is this one cartridge you can't get a bullet started in. So you grab the Nexpander and PLONK! it's open and ready to load and you roll on. The Freechec Tool was designed as a way to make gas checks from aluminum cans. Now there are economic reasons that can be used for reasons why to make gas checks from aluminum cans, but one of the main reasons was... YOU CAN DO MORE THAN THE ORDINARY GAS CHECK!! For instance, you can make the gas check 1 layer, 2 layers or 3 layers thick. Thus you have another way to experiment with a variable in the accuracy wars. By varying the thickness of the gas check you sometimes can tweak a bit more accuracy from a given bullet. Another reason is... gas checks for those hard-to-find-gas checks-for calibers. Need a gas check for your Raston-Gasser? Make a Freechec Tool for it! And to me the coolest thing - GAS CHECKS FOR PLAIN-BASE (non gas check) BULLETS!! Yep. You heard me correctly. 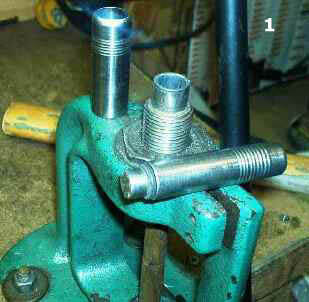 With the proper Freechec Tool you could make gas checks that go onto plain-base non gas check bullets. Why would you want to? There are a number of reasons, among which are: 1> the ability to drive the plain-base bullet at higher pressures than normal without leading 2> increased accuracy with some loads 3> decreased leading with bullets that have marginal lube capacity. Addressing #3 - marginal lube capacity. Some years ago a manufacturer contacted me about testing a new bullet for the .44 Magnum. It was a 320 gr. 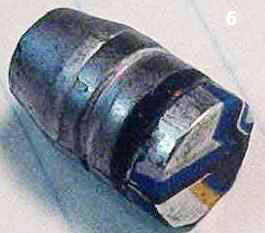 plain-based cast bullet, flat-nosed, with several small round lube grooves. We ran them in several Redhawk's and found they leaded like crazy once the velocity got over 1100 fps. I used Freechec's on the bullets and ran them to 1500 fps with no leading problems. I shared this with the manufacturer and they redesigned the bullet with a single large flat lube groove. That solved the leading problem, and we no longer used the Freechec on them. But the Freechec allowed a marginally lubed bullet to run at much higher velocity and pressure than normal. And do it well. I have a 270 gr. bullet that is very accurate in my Freedom Arms 454 ... BUT ... it has one very small lube groove and leads easily when I get the velocity up over 1200 fps. By putting a plain-base Freechec on it I can easily run it to 1600 fps if I so desire and the bore stays clean. For this test I used two different molds, the Lyman 454424 Keith SWC .45 and the SSK 270-451 truncated-cone 45 bullet. I cast them from a soft alloy of 1 to 40 tin and lead. All the bullets were sized to .452" and lubed with Apache Blue. Apache Blue has proven it's ability to stand more heat and pressure than standard Alox lubes. I took twenty-five of each of the bullets and put a Plain-Base Freechec on them during the sizing/lubing operation. Twenty-five of each of the other bullets were used in their normal manner as plain-base bullets. All were loaded over 20 gr. of 2400 in 454 Casull cases and fired in the 7 1/2" Freedom Arms 454. 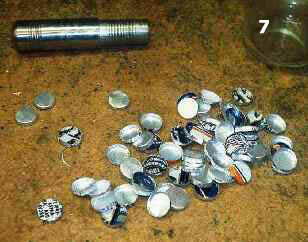 Using the plain-base #454424 loads I fired 5, plinking tin cans and rocks. Then I fired 5 at a bullseye at 25 yards. I then fired another 5 at plinking targets. Then the next 5 rounds were fired at a bullseye at 25 yards. By the last 5 shots the bore was heavily leaded. Groups were: #1 Group - 2 5/8" #2 Group = 3". After cleaning the bore of all lead I fired the #454424 Freechec loads in the same manner as above. I fired 5 at tin cans, 5 on a bullseye, 5 more plinking, then the last 5 at a bullseye ... all at 25 yards. The bore looked "smoky" but was not leaded. Groups were: #1 Group = 1 3/4" #2 Group = 2". 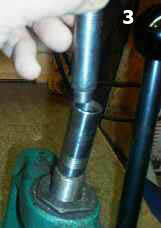 One pass with a brass brush and the bore was clean. I then ran the same test with the SSK bullet. 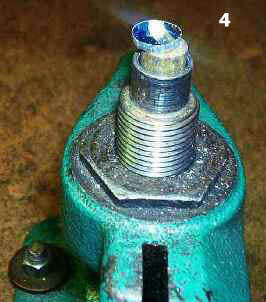 It has a much smaller lube groove than the Keith SWC and tends to lead more easily. By the end of 20 rounds of the plain-base loads the bore was crusted! Group #1 = 2 1/4" Group #2 = 4 1/16"
The Freechec SSK bullets were fired once the bore was cleaned (What a mess!) and after 20 shots I checked the barrel to find it ... CLEAN! Smoky like with the Keith bullets, but no leading. Group #1 = 1 7/8" Group #2 = 1 7/8". I proved to my own satisfaction that the plain-base Freechec will reduce leading and help keep accuracy, even with marginal bullet alloys. Now all we have to do is convince Paco (or someone) to start producing the Freechec Tool again. Forming Die screwed into the press, the cutter and the punch. Cutting the aluminum with the cutter. Whack it with a wood or plastic mallet and cut an aluminum disc. Cutter with the disc in it is slipped onto the Forming Die, the punch is ready to slip in. Whack the punch with the mallet. 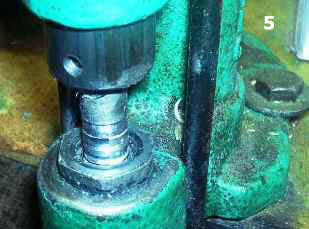 Lift off the punch and the cutter, push formed Freechec up out of the Forming Die. Slip the Freechec onto the base of a bullet and put into the lubri-sizer. 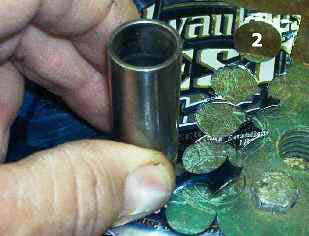 Run it down to and lube the bullet, this form-fits the Freechec to the bullet base. Plain-base bullet with Freechec installed. I find plenty of material to make Freechec's from in the ditches along my property. Some folks seem to think other folks have nothing better to do than pick up after them. However, in this case it is handy. Warning: All technical data mentioned, especially handloading, hunting and bullet casting, reflect the limited experience of individuals using specific tools, products, equipment and components under specific conditions and circumstances not necessarily reported in the article and over which The Los Angeles Silhouette Club (LASC), this web site or the author has no control. The above has no control over the condition of your firearms or your methods, components, tools, techniques or circumstances and disclaims all and any responsibility for any person using any data mentioned. Always consult recognized reloading manuals.